For those of us who spend hours making jack-o-lantern faces that just look like a jumble of shapes, a father-son engineering team from Indiana has a solution: PunkinBoT, the pumpkin-carving robot. With Brian and Alex VanDiepenbos’ invention, a computer converts the pumpkin design into code that directs the cutting tool on where to carve. 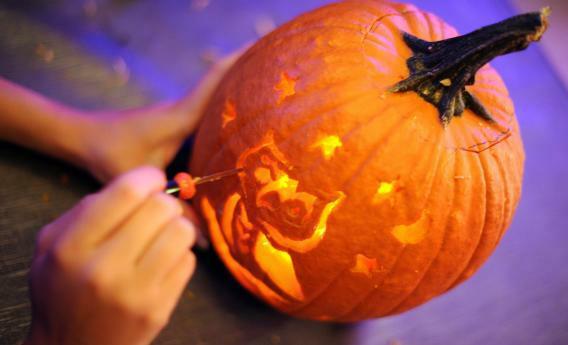 It only takes about five minutes and creates stunning jack-o-lanterns. PunkinBoT v2.0 can make both traditional jack-o-lantern faces and more elaborate cut-outs, like images of bats, Frankenstein, a ghost, a wolf, or a skull and crossbones. Part of the trick is that the robot does not cut all the way through the pumpkin. Instead, a screwdriver-like head merely picks away at the top layer. Alex believes that this method actually makes for better jack-o-lanterns. “The reason why you do that is because when you leave the surface flesh peeled back but the inner layer intact, the light actually glows brighter because it has nowhere to disperse to,” he explained to the Goshen News earlier this month. The VanDiepenbos team first presented a prototype at the Detroit Maker Faire in July, where it won the Editor’s Choice award. Since then, they’ve upgraded to PunkinBoT 2.0, which is capable of far more elaborate designs. But sadly, the PunkinBoT 2.0 has a little less of the Halloween macabre: The original carried out the carving with what looked an awful lot like a severed arm. Then again—it is a pumpkin-carving robot.